Alabama’s pace of population growth increased in 2017, but the state remains slow-growing compared to most of its Southeastern neighbors, according to the latest estimates from the U.S. Census Bureau. Two factors holding down growth: Alabama has the nation’s second-highest death rate and one of the lowest rates of immigration from other countries. 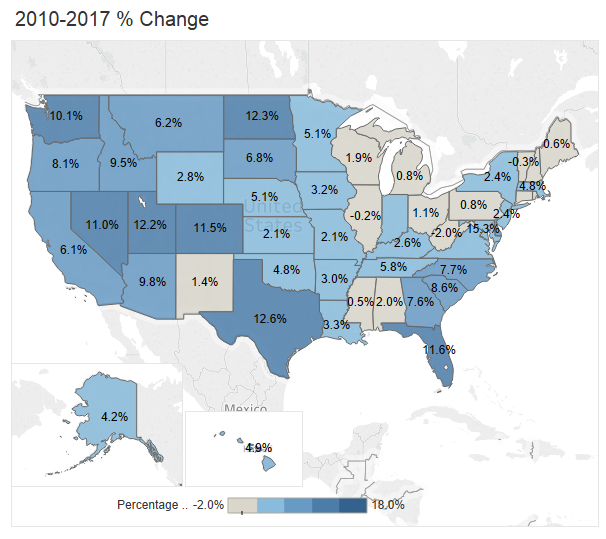 For the first time in several years, Alabama had a positive rate of domestic in-migration — more people moving to the state than leavingvfor other states, according to PARCA’s analysis of the recently released data. For most of the past decade, more U.S. residents have left Alabama than moved into the state. While the new Census estimates show Alabama with a net positive in domestic migration, most other Southeastern states have much higher rates of domestic in-migration. That’s been true since 2010. A case in point is South Carolina. In 2010, Alabama’s population was greater than South Carolina’s: 4,785,579 vs. 4,635,834. But since 2010 South Carolina has added almost 400,000 new residents with the strongest source of growth being through domestic in-migration. Alabama has added fewer than 100,000 residents over the same period. According to the estimates, South Carolina’s population now exceeds Alabama’s, with 5,024,369 residents to Alabama’s 4,874,747. After the next Census, due to its relatively sluggish population growth, Alabama is expected to lose a seat in the U.S. House of Representatives. North Carolina is expected to gain a seat and Florida is expected to gain two. Though Alabama may be beginning to attract residents from other states, our state residents are dying faster and earlier than residents of other states. Alabama has the country’s second highest death rate in 2017, according to Census estimates (only West Virginia’s is higher). Over 52,000 Alabamians died in 2012, yielding a death rate of 10.8 per 1,000 population. That’s twice the rate of death rate of the leading state, Idaho, which has a death rate of 5.4. And 2017 is not an anomaly: Alabama has been No. 2 every year of this decade, except for 2012 when our death rate ranked No. 3. Alabama’s high death rate isn’t just noted in Census estimates. The Centers for Disease Control consistently ranks Alabama’s death rate from a variety of leading causes of death in the country’s top 10. In 2016, Alabama had the fourth highest death rate from heart disease, the nation’s leading cause of death. Alabama also had the country’s highest death rate from stroke, ranked No. 7 from deaths from cancer and Chronic Lower Respiratory Diseases. In 2016 Alabama had the country’s highest infant mortality rate and the second highest rate of deaths from firearms. The more than 58,000 births in Alabama, a rate of 12 per 1,000, more than offset the number of deaths, resulting in a net positive natural increase in the population of approximately 6,000. Alabama’s birth rate ranked 30th among the US states, slightly below the U.S. average of 12.16. A final factor in population change is international migration and relatively few migrants from other countries are moving to Alabama. In 2017, Alabama ranked No. 46 among U.S. states in its rate of international in-migration. Five states attracted less than 1 foreign immigrant for every 1,000 residents: Alabama, Mississippi, West Virginia, Montana and Wyoming. Most states added population in 2017, according to the estimates. Only, Illinois, West Virginia, Wyoming, Louisiana, Alaska, Mississippi, and Hawaii lost population. Alabama had a net addition of 14,202 residents from July 1, 2016 to July 1, 2017, a 0.3 percent increase in the state’s population. Alabama’s percentage population increase ranked 33rd. Since 2010, Alabama’s population has increased by 94,612, or 2 percent, ranking 38th among the states in percentage population growth during that period.